The Alvis TD 21 was a big jump, design-wise, for Alvis. The TC 21 was a much more old-school British automobile and the TD 21 (and transitional TC 108G) looked thoroughly modern for the late 1950s. Something you could compare to an Aston Martin of similar vintage. The TD 21 was built between 1958 and 1963 before being replaced by the TE 21. Power comes from a 3.0-liter straight-six that made 115 horsepower. This is a Series I car, which were built between 1958 and 1961. TD 21s could be had as a Coupe or Drophead Coupe and all cars sat four at topped out at 103 mph. This 17,000-mile example has an automatic transmission which has been rebuilt. 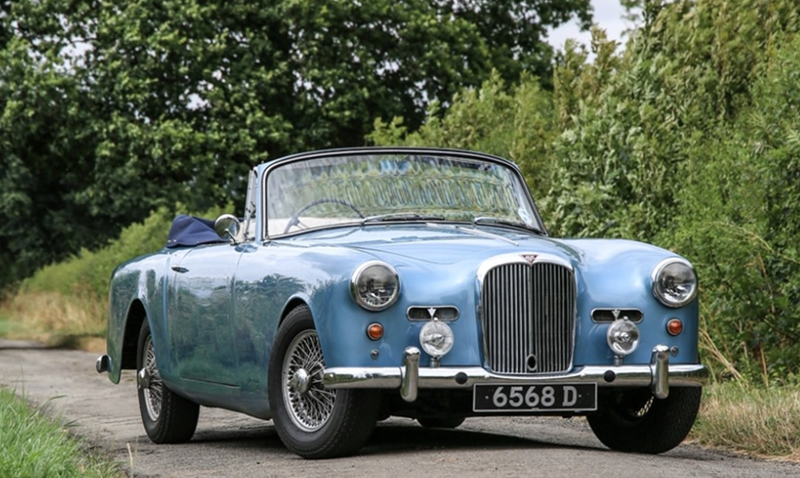 It’s a classy British drop-top that’s ready for touring. It should bring between $69,000-$79,000. Click here for more info and here for more from this sale. This entry was posted in Uncategorized and tagged 1960, alvis, auctions, cars, classic cars, drophead coupe, historics at brooklands, td 21 by classiccarweekly. Bookmark the permalink.